Taste test: These are very bland barbecue-flavored potato chips. 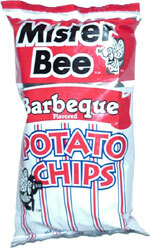 They were less greasy-tasting than some of the other flavors of Mister Bee chips, but didn't have many admirers around the chip bowl. Smell test: Good barbecue powder smell.